Last year, I finished school half a year early so I spent half a year finding job and traveling. I decided to go to Kyoto with my friend. Kyoto is my all time most favorite city in Japan. The city is beautiful and full of shrines and temples and reminders of Japan’s old capital while it is modern and friendly city at the same time. A lot of foreigners like to visit this city for sightseeing. There are just so many places to see in Kyoto. That was probably the 5th time I visit Kyoto. This time I decided to do something a bit different from my other visits–I transformed myself into Maikoさん while my friend transformed into Juni (meaning 12) Heian princess that has to wear 12 layers of clothes weighing around 20 KGs! We had such a great time and I did film a video about my experience and put it on YouTube as well-Check it out! First, let’s talk about some basic Maiko FYI! What’s Maiko? Geisha? And Geiko? 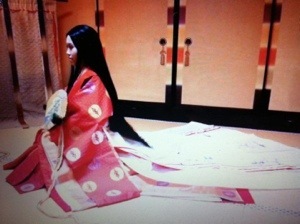 Maiko is an apprentice of Geisha who is going through arts training for about 5 years. ‘Mai’ means dance and ‘ko’ means child. Thus, maiko’s direct meaning is a ‘dancing child’, an apprentice of Geisha before becoming a real Geisha later on. Geisha is a woman who is trained in the Japanese traditional arts such as dancing, singing, and others. Literally, ‘gei’ means art and ‘sha’ means person so in this case, it is ‘the person of art’. As you may have seen in the movie ‘The memoirs of Geisha’, Geisha dances in traditional Japanese style and was trained for many years since they were little girls. Geiko is almost the same as Geisha. The only differences may be their location, customs, and traditions. The word Geiko mostly represents Geisha in Kyoto but the word Geisha generally refers to Geisha around Tokyo area. 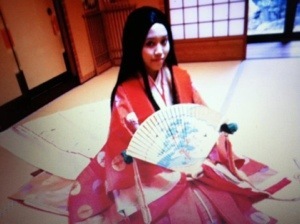 However, the word Geisha is more popular for foreigners and become the name for Geisha in general (because of the movie? 😉 ). The difference betweet maiko and geisha is the hair, make up, and kimono. I prefer Maiko since the make up looks a lot prettier (for me). I won’t go into details with the appearances but basically, Maiko’s lips and eye makeup are more red while Geisha’s eyes do not have red lines and paler red lips. Also, maiko’s face is whiter than Geisha’s. These appearances also differ with the rankings- Junior Maiko, Senior Maiko, Junior Geisha, and Senior Geisha. Are Maiko and Geisha prostitutes? I remember something about this from the movie but had doubts whether it’s true. So, I did some research. It is said that Maiko and Geisha are NOT prostitutes by any means. This profession is rooted deeply within the traditional arts and is non-sexual in any way. According to some source, they are believed to be prostitutes because of the misunderstanding by the US service men during World War II. And probably the movies and tales that are told and misinterpreted. However, these days many prostitutes do dress up as Geisha to attract customers. 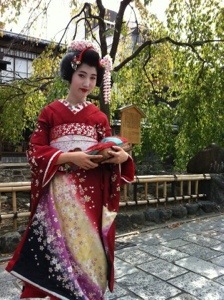 Why is Kyoto famous for Maiko and Geisha? That is a good question. I always think of Kyoto every time I think about Maiko, Geiko, and Geisha. Apparently, there were Maikos and Geishas around Tokyo as well. They were just in different location and less elaborate. According to some sources, they are called ‘Hankyogu’, which means ‘half price’ or ‘half charged’. They disappeared quickly leaving the title to the famous Geishas in Kyoto. My experience – How to do this? As of how to do this, I will show you some easy steps and guides you can do. I was very lucky and got to do in a really great discounted price. The experience was more than I can describe. It was worth every penny. Here are some steps! 1) Plan you trip to Kyoto. Leave about 3 hours for this experience. The make up and dressing up took about 2 hours for me. 2) Find a studio near your hotel or the area of your choice. >> I did this in Gion since it is the place where REAL maikos work and it’s one of my favorite areas in Kyoto. A perfect setting for a stroll in Kimono as MAIKO san! This is the studio I went to has branches in other famous areas in Kyoto such as Kingakuji shrine, Kiyomizu shrine, etc. Some links to the studios I found – Yumekoubou (the studio I went to), Maiko Henshin, YumeYakata, Katufumi. 3) Book a plan at the studio. >;>; There are many plans such as studio plan, strolling plan, and others. Prices differ according to the plan. Also, you can choose to request for a professional cameraman or if you have your own camera and a friend to help, you can do that yourself as well. You may also choose to add extra CDs, extra shots and others. For me, I brought a friend to help taking all the videos and pictures. I also requested 20 studio shots with a professional cameraman. More than that, I choose the walking plan so I got to go out for a walk as Maiko san in Gion area and my friends took all the pictures for me. The CDs I ordered came a month later in the mail. All of this was about 12,000 yen for me which was very worthy! 4) Go to the studio. >> In my case, since I took the studio shots and a walking plan, the process takes about 3 hours. First, make up. Then, kimono. Then, put on a wig. And you’re done! When this is all done, they’ll take you to a studio and a camera man will take photos for you. Then, someone will take you to walk outside. The shoes are the ones Maiko really wears so it was quite hard to walk on but I was able to get the grip at the end. Choosing Kimono was very fun. Each piece is very expensive! I choose the red one with beautiful prints on it. 5. Enjoy >> If you choose the walking plan or any other plan, be prepared that some tourists will ask to take photos with you. 🙂 I highly recommend to take a friend with you for this experience because you will surely want extra photos. Here are my studio photos taken by a photographer. The CD and a small postcard with my picture on it are sent to my house. I could not believe I looked like that day. It was great fun. The Kimono and the shoes gave me a bit of a hard time but I enjoyed this experience very much. You definitely should try! It’s a great experience. I hope you get to do this one day. ^^ thanks for reading! Ever wanted to dress up as a Maiko? This post will help you get the idea what the process is like. It looks tiring, but fun! Thanks! 🙂 and yes, it was a bit uncomfy but great fun! Thank you so much for saying hello! hope you’ll enjoy your time so much. thx for the sharing it was so details and fantastic experience. i am planning to go Kyoto on March so may i ask which studio you eventually picked? do you need to pay extra for the half fig? I picked yume kyoto :). You pay extra for hair and if you choose a more expensive kimono, it’s an extra charge as well. Enjoy!